To the first Australian’s the Cherry Ballart, was a tree with many uses and cultural significances. 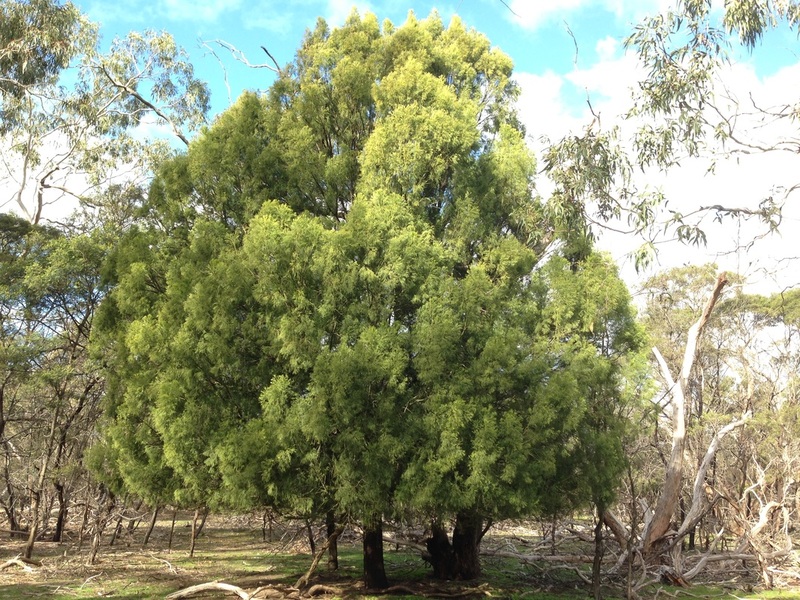 It’s use in ‘welcome to country’ and cleansing ceremonies draws on the knowledge that the tree is a partial parasite, taking nutrients from its host plant without doing it any harm. In human terms this is a beautiful metaphor for visitors to Country who are being invited to share the resources of the land while caring for it as if it was their own. It is also a reminder of the importance of cooperation between people if all are to prosper. ​The Cherry Ballart was considered by the Wadawurrung to be a men’s tree because remarkably its seed appears on the outside of the edible fruit. This makes it a very convenient fruit to eat because it can be held by the miniature green olive like seed while the lustrous cherry coloured fruit is bitten off. The fruit has the delicate texture of a European cherry and is quite sweet with a subtle salty finish. It makes a refreshing and welcome snack on a Winter/Spring bush walk but like many of the native fruits in the southern states, it is small, about the size of a black current, and slow to harvest any large quantity. The strong wood was used by the first Australians to make spear throwers and the sap was used to treat snake bite. Europeans have used the Cherry Ballart to make furniture, tool handles and gun stocks. Though a beautiful and useful plant the Cherry Ballart is rare on farming land because it was removed, its toxicity to stock making it unwelcome. As its botanical name suggests, the Cherry Ballart has the appearance of a Cypress but it is far more elegant with a ‘leaf’ colour of green to bronzy-green. It is a small tree growing up to 6m tall and wide with a dense foliage that is often pendulous. It is very distinctive and is usually found in protected locations on roadsides, in woodland reserves and open forests. Its parasitic habit enables it to survive on very dry shallow soils. Propagating the Cherry Ballart has led to many experiments and many failures in nurseries. The mystery of germinating its seed has never been solved. I have even tried feeding the fruit to my chooks, hoping that digestion in a birds gut might do the trick, needless to say I had no success. Could it be the handsome Cherry Ballart, a symbol of cooperation between peoples and caring for the land, is trying to tell us something?